1 in 47 countries on the App store, including the United States, United Kingdom, Australia, France and Japan. More updates are coming to Toca Life City later this year! Welcome to Toca Life City, a metropolis filled with everyday fun! Customize characters, explore exciting locations and find hidden treasures there’s something in every corner! Thanks to the great response to Toca Town, we're bringing you Toca Life a series of apps that gives you an even bigger world of everyday fun. First out in the series is Toca Life Town and Toca Life City! Try, experiment and customize. 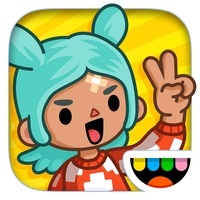 It’s time to get creative in Toca Life City! Change outfits, dye your hair any color and switch hairstyles in the Hair 3000! There are millions of ways to personalize the characters we dare you to create them all. Say hi to 4 new locations and 28 characters! Go shopping at the mall, grab a bite to eat at the food park or invite friends over to your loft. Characters, and anything they are holding, can easily be transported between locations. Just like in Town, there are treasures hidden everywhere in the City! Take out cash at the change outfits, wash your clothes and go for coffee with a friend. There’s something for every age! 4 locations to explore loft apartment, shopping mall, hair salon and food park 28 characters that are customizable in 3.1 million different ways! 47 hairstyles to test, 37 colors to choose from and various outfits to try on 7 different food stands at the food park have some sushi with your burger and try the famous fish ‘n chips! Shop for clothes, kitchenware, pets, toys and groceries at the mall No timelimit or high scores play for as long as you like No thirdparty advertising No inapp purchases Toca Life City was uniquely created for you by you. We received over 10,000 feature requests after Toca Town was released, which we added directly into this app. We want to keep hearing from you so don’t be shy and keep on suggesting! What do you want to see next? Share your ideas with @tocaboca on Facebook, Twitter, Pinterest and Instagram! Check these links to find your download for Toca Life: City for & iOS or for your device iPhoneiPadiPod Touch. The app Toca Life: City is compatible with te following devices.